The Fellowship was fortunate enough to obtain a copy of the KING CONAN: THE SCARLET CITADEL trade paperback from Dark Horse Comics. Timothy Truman writes, Tomás Giorello pencils, José Villarrubia colors, and Richard Starkings and Comicraft’s Jimmy Betancourt are credited for the letters. 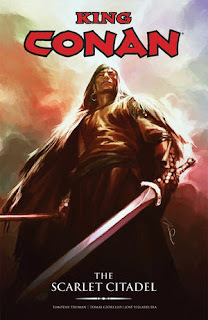 This volume combines the four-issue run which adapts Robert E. Howard’s story. A young minstrel is sent to an aging King Conan to learn some new stories, and it seems the old warrior is in a talking mood. The Scarlet Citadel is a place that few have escaped, and the grizzled old king weaves the tale of his own imprisonment there, as well as the vengeance he gave to his captor. It would be difficult to make any significant comment on the story, of course; it comes from the source. It’s a pretty standard “dungeon crawl” with monsters, swords and sorcery, from a time when these things were still being defined. All disclaimers aside, though, I think it’s adapted well here. Mr. Truman gives it to us from a fresh perspective without compromising the epic fantasy feel. The art is both gritty and imaginative; there are some nice horror aspects to this story in addition to the sword battles, and both are handled well here. I definitely recommend this book. The style translates well to the medium, and this might be a nice way to introduce young readers to the epic fantasy genre. KING CONAN: THE SCARLET CITADEL trade paperback is available 2/15 at your FLCS or by order from darkhorse.com.